A gang of ruthless burglars have now hit beleaguered Corby licensed premises nearly fifty times since the end of August. Under siege pub landlords across the borough have pledged to set up their own nightwatch to help tackle a crimewave that has seen burglars run amok, targeting bandit machines night after night. They say that although front-line police officers are keen to help, they feel let down by the fact that underfunding means Corby doesn’t have its own police station and consequently not enough police officers stationed in the town to catch the burglars in the act. Most of the smash-and-grab offences have been carried-out in under five minutes. Licensees held an emergency meeting on Wednesday at The Viking Club on the Danesholme estate to try to come up with a plan to help police stop the bombardment. They are angry that they feel clear CCTV images of suspects and vehicles passed to the Operation Trebuchet investigating team has not resulted in more action. 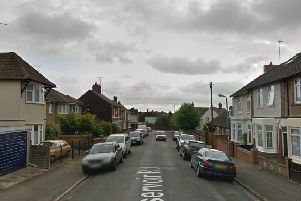 They also believe that the criminals are growing in number and ferocity after an axe was found at the scene of a recent burglary, and four offenders have now been seen on CCTV. One premises, Corby Conservative Club, has been burgled an astonishing six times within a two-month period, including twice in the past week. At Wednesday night’s meeting, chair of Corby Pubwatch Mick Willey said: “We have counted 46 offences in 75 days in licensed clubs and pubs in Corby. “In the last week we believe they are getting more violent with major damage being caused. “We had a Pubwatch meeting in October where we said we were living in fear. “I wrote to the chief constable and received a reply back to say it had been passed to the local policing team. One landlord who did not wish to be named discovered a hammer at her premises after a break-in and said she was told just to throw it away. An axe was only collected on the second visit by police officers following one burglary. Mick added: “What do we do? The police aren’t picking up implements and aren’t using information that would be helpful. “We’re providing them with every little bit of information and they haven’t got the staff to do anything about it. “It’s a four-minute smash and grab. Licensees believe the crimewave started around August 28 at the Harper’s Brook Pub on the Oakley Vale estate. There were then four incidents in a one-night rampage on September 8 and then a steady stream of offences until this week when there were five offences in four days. Landlords said how they had seen suspects brazenly doing daylight recces in their premises - walking in, putting a pound in the bandit machine and then leaving again. They have now said that they are prepared to carry out all-night vigils to help the police to respond quickly if there is a break-in. Many of the landlords live above their pubs and they have said they will wait up at certain times to listen out for offenders and will be on hand to phone police immediately if they hear suspicious noises. They also vowed to ask taxi drivers to keep an eye out for suspicious activity in the small hours when most of the burglaries are taking place. Licensees said they were worried that the crimes were escalating. One said: “At first it was crowbars and one or two people. “Now it’s hammers and axes and four people on CCTV. Some landlords have told the Northants Telegraph they are ready to quit because they are so scared about being broken into. Detective Inspector Wayne Preece said: “Firstly, I completely understand how frustrated and angry affected business owners in Corby are feeling at the moment and I would like to reassure them that catching the people responsible for this crime series is a top priority for Northamptonshire Police. “We have released a photo of a man we would like to speak to in connection with this crime series and are still hoping he, or someone who knows him, will come forward. We also have additional officers patrolling the area and continue to have a team of detectives working on bringing the offenders to justice. “The Force’s Crime Prevention Team is also continuing to work with businesses across Corby - their input and the technology they have access to has already prevented items being stolen from businesses in the area. Police are still looking for a Corby man named locally as Stephen Hill, who they believe may have vital information about the burglaries. Anyone who knows where he is should call 999 immediately. August 28 - Harpers Brook, Butland Road, Corby. September 8 - Grampian Club, Patrick Road, Corby. September 8 - Harpers Brook, Butland Road, Corby. September 8 - Breakers Bar, St James’s Road, Corby. September 8 - Chequered Flag, Causeway Road, Corby. September 14 - Corby Conservative Club, Cottingham Road, Corby. September 15 - Kingfisher, Fotheringhay Road, Corby. September 15 - Shire Horse, Willowbrook Road, Corby. September 15 - Fishing shop, Weldon Road, Corby. September 16 - Rushton Hall, Rushton. September 17 - Cardigan Arms, The Jamb, Corby. September 17 - Spread Eagle, Cottingham. September 19 - Rockingham Arms, Studfall Avenue, Corby. September 20 - Corby Conservative Club, Cottingham Road, Corby. September 20 - New Inn, Lloyds Road, Corby. September 20 - Saxon Crown, Elizabeth Street, Corby. September 27 - The Everard Arms, Cottingham Road, Corby. September 28 - Corby Conservative Club, Cottingham Road, Corby. September 28 - The Ex-Servicemen’s Club, Lloyds Road, Corby. September 29 - Spread Eagle, Cottingham. September 29 - The George, Weldon. September 29 - The Blue Bell, Gretton. September 29 - Spread Eagle, Corby. September 30 - New Inn, Lloyds Road, Corby. October 4 - Beefeater, Little Colliers Field, Corby. October 4 - The George, Weldon. October 9 - Great Oakley Cricket Club, Great Oakley. October 15 - Corby Conservative Club, Cottingham Road, Corby. October 16 - Samuel Lloyds, Gretton Brook Road, Corby. October 21 - Breakers Bar, St James Road, Corby. October 22 - Kingfisher, Fotheringhay Road, Corby. October 22 - New Inn, Lloyds Road, Corby. October 23 - The Charter, Rothwell. October 25 - Cardigan Arms, The Jamb, Corby. October 28 - Gretton Sports and Social Club, Gretton. October 29 - Corby Conservative Club, Cottingham Road, Corby. October 29 - Red Lion, Middleton. October 31 - The Raven, Rockingham Road, Corby. November 3 - The Talisman, Danesholme Centre, Corby. November 4 - The Premier Inn, Little Colliers Field, Corby. November 5 - Samuel Lloyds, Gretton Brook Road, Corby. November 6 - Corby Town FC, Steel Park, Corby. November 18 - Corby Conservative Club, Cottingham Road, Corby. November 18 - Corby Town FC, Steel Park, Corby. November 19-21 - Corby Town FC, Steel Park, Corby. November 19-21 - Corby Conservative Club, Cottingham Road, Corby. November 20 - The Talisman, Danesholme Centre, Corby.